Congress has created a procedure that permits any person to file a complaint in the courts about the behavior of federal judges—but not about the decisions federal judges make in deciding cases. The Judicial Conduct and Disability Act of 1980 (.pdf) sets forth what may be complained about, who may be complained about, where to file a complaint, and how the complaint will be processed. 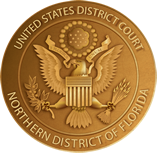 Litigants who wish to file a complaint may do so using the Complaint Of Judicial Misconduct Or Disability form available on the 11th Circuit Judicial Complaints resource page.